Years ago Timex watches came out with various commercials showing their watches being abused in assorted situations - people skiing down a slope and falling or a guy using a jack hammer or something along that line to show how tough their watches were. The announcer would come on and say - Timex watches, they take a licking and keep on ticking. Well, Jan and I celebrated our forty third wedding anniversary recently and I'm pleased to say, we're still ticking along. I didn't say tickling, I said ticking, like a watch. I didn't include any pictures of us as we look now, the contrast is so great, that you probably wouldn't believe that it was the same two people. It's amazing what time does to a person. I wish I weighed now what I did in these pictures. I think I had a 29 inch waist then. Heck, my head probably wouldn't fit into a 29 inch stocking cap right now. I can't recall when the last time was that my hair was anything but grey... or white. I suppose I was more handsome back then, in an immature, boyish sort of way. They made me shave off my mustache when I went into boot camp, which I guess was just as well, at the time it made me look like I'd been drinking chocolate milk and needed to wipe off my mouth. I didn't waste any time when I got out of boot camp; we were married I think just a few days later. While I was in boot camp I became painfully aware of how lonely a fellow can get, and I didn't want to let someone else scarf up Jan while I was off on a ship somewhere. It was the best decision I've ever made in my life. We've been through a lot; seven children, ten grandchildren, ten years at a religious community in the wilderness of Alaska, assorted illnesses, childhood traumas, lousy fishing seasons, a plane wreck and having nine people crammed together in a one bathroom home to mention just a few. We have a very dear friend who just got married. She did it right, waited for the right man and didn't compromise her values, even though time was marching on and the desire to be married was great. I'm delighted for her. I believe that she will have a lasting marriage. I would just remind her though, that there is no Camelot. Trouble will find us no matter who we are, but what a blessing to find the right mate to go through life with. With a loving spouse and the blessings of the Lord, there isn't anything that you can't face together. I pray that everyone who is married, whether you're a newly wed or an old couple like Jan and I will take a minute to reflect on what attracted you to that person and will let them know you love them. Years ago, when I was still a kid and my interest in fishing was starting to rev up, I would go to the Super X drug store at least once a month to see if the latest copy of Field and Stream or Outdoor Life or Sports Afield had come out. I devoured them, hoping to glean some secret to catching more fish. No doubt fishing someplace other than the local mud filled streams and ponds would have been a good first step to catching more, but you have to do the best you can with what you have. Anyway, while I was perusing the magazine isle, I always passed by the ladies section of magazines- Better Homes and Gardens, Ladies Home Journal, Fashion, stuff like that. Then, at the end of the section would be the more risque publications, Cosmopolitan and True Confessions and whatever other titles there were. These magazines were designed to titillate their readers with scandalous articles about illicit affairs or whatever other shameful or disreputable goings on the reader might find entertaining. Speaking of true confessions,I was speaking to my son Ben yesterday, and he too had a true confession. When I mentioned that the house in the above picture had been sold, he told me about a childhood situation involving the house. Apparently, he and Brian and Gabe Baylous were climbing the rather steep hill up behind the green house when Ben stepped on a fairly good sized rock in the side of the hill and it got dislodged. They watched it as it tumbled down, picking up speed as it went, bouncing over roots and off of trees like the steel marble in a pinball machine as it made its way to the bottom. Soon enough it became apparent that it would hit the back of the house, which is built right up against the side of the hill. It's not all that unusual for rocks and dirt to slough off, and after days of heavy rain, even trees have been known to tumble down. As it was, there was a small window located in the rear, and true to the Botts luck, which obviously has been passed down, the rock found the only window in the back and launched through it. Of course the boys finished charging up the hill and out of sight, never even considering accepting responsibility for the accident. That's exactly what I would have done- and unfortunately did on more than one occasion growing up. Since we're on the subject of confessions, I have several that I suppose I should get off my chest. I well remember being a paper boy when I was about twelve or so. I had finished the route and was walking down an alley when I passed by a garage that had a window facing the alleyway. The window was covered in hardware cloth. For those who don't know, hardware cloth is like a really heavy duty chicken wire with more mesh- much stronger. The hardware cloth was over the window to protect it from flying stones and sticks, such as might be thrown by a passing car. However, it was not meant to protect the window from idiot boys. For whatever reason, lets call it a science experiment, I wondered if the mesh would protect it from a bigger rock, so I picked up about an eight pound hunk of granite and tossed it square at the window. Needless to say, steel bars would have been a better bet for protection with me running around town. Of course I hightailed it out of there and the thought of confession never entered my mind. Then there was the matter of the collectible coins in my older brother's room. Years ago he dabbled a little in collecting coins. He worked at Mac's Trading Post long before I did, and frequently ran across Mercury Head dimes and older pennies and Indian Head nickles, all of which were becoming increasingly rare. He had several folding blue coin books which had holes with dates printed under them for the corresponding coins. Well, being the wonderful brother I was, periodically I would find myself in need of a pop or candy bar, and unable, or possibly too lazy to try to find, a few pop bottles lying around, I would go to my brother's room and just punch out a few coins. I may have intended to replace them, though I don't know where I would have run across any such coins aside from the ones I found in his room. In any event, I did it. Sorry Mark. While I'm at it, I may as well admit that I took your Righteous Brothers 45 RPM record- You've Lost That Loving Feeling. Teresa Nolan had broken up with me in 7th grade and I was devastated, so I sent it to her. She never did get back with me, and I don't know what she did with the record. If you like I'll send you a CD with the song on it. Also, I imagine by now that the combined value of those semi- rare coins might be worth at least $50.00 or somewhere thereabouts. Guess I'll send along a few silver Maple Leafs somewhere down the pike to compensate you. Whew, I feel so much better. Especially since I don't think my brother reads this blog. A few years ago I was working at the boat haul out getting some plank work done, when the shipwright, John Kveum, mentioned the location of an outhouse across from the haul out. 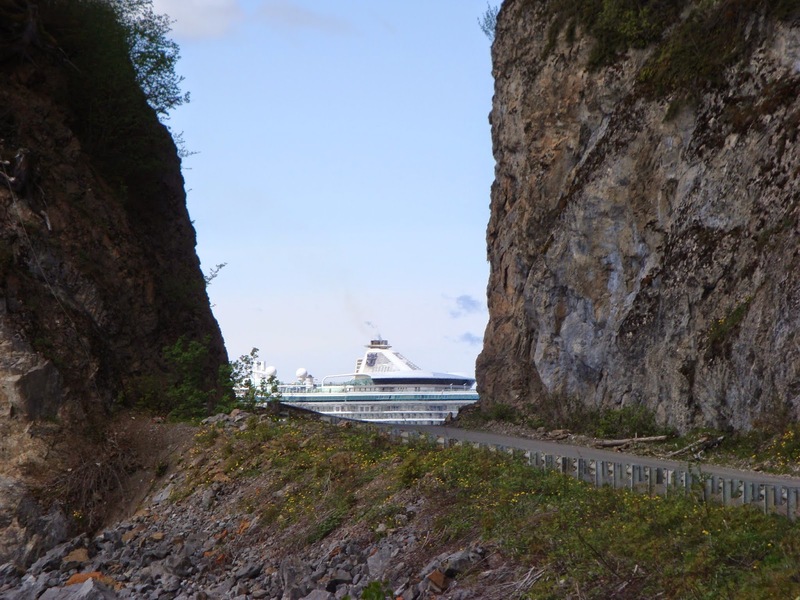 It was tucked away in a little bit of an alcove under the towering rock wall of what we here in Hoonah know as the tunnel. There were rocks all around the base of the outhouse, and of course I had to do a blog post about it. The idea that people would get beaned while on the way to a porta-potty kind of tickled me. I have a strange sense of humor. Anyway, the next year, they moved the potties. Probably wisdom to do so. I spotted some fairly good rocks where it had been residing, and if one of those had hit the outhouse when you were in there, if you didn't have to crap when you got there, you'd probably have to afterwards. I guess last year there was a few more rocks falling off the face of the tunnel and there was a fear that a tourist might get hit by one and of course that would be bad for business. Apparently it's OK if a resident gets hit- we don't count. In typical fashion, when someone else is footing the bill it's easier to go with the deluxe version of something than if you had to fork out all the money yourself. As you can see, the bottom picture is what the tunnel looked like before the blasting, scraping and hauling started. Instead of just taking off some of the loose stuff, or taking the rock back a few feet, they've totally overhauled the whole blasted tunnel. I'd say its just a bit of overkill. It reminds me of a time when I was stationed in Charleston South Carolina. I was out hunting squirrels at the Old Tail Race Canal. There was a stretch of woods there with big oak trees and plenty of squirrels, to say nothing of mass numbers of poisonous snakes, fire ants and spiders. I'm sure there were plenty of other things that nightmares are made of, but I didn't want to look too close. I never would have gone hunting otherwise. Anyway, I was sitting on a log on a fine fall afternoon waiting for the squirrels to start moving. They always came out of the trees late in the day and scampered around the ground looking for acorns. There were years worth of dry leaves on the ground and I could always pinpoint where the squirrels were by the scuffling sound of the leaves. The day was warm and as I sat on the log, I was getting a little sleepy. I was right on the verge of dozing off when I heard a noise in leaves close by. It wasn't a squirrel though- not big enough. Not a lizard either, it was moving too slow, but there was definitely something moving over the leaves. I decided to investigate. I had only gone a few yards when I saw the largest spider I've ever seen walking across those dry leaves. It was big enough to make noise when it walked. To say the least, I freaked out. I didn't want that monster sneaking up on me when I was all engrossed in shooting some game, or snoozing, so I did the only logical thing I could do- I shot it. I had a twelve gauge shot gun loaded with number six shot and I unleashed it on that sapsucker. Was it overkill? Probably so. Did I have any regrets though? Certainly not! Back to the work on the tunnel. Was it really necessary to take off half the mountain to keep a few rocks from coming down? I don't think so. Is it overkill? Undoubtedly. Will it even be done before the first ships arrive? Can't say, don't really care. It would actually be kind of nice if it wasn't. It would be fairly peaceful in town in the summer for a change. Maybe I could start a new business for the days when fishing was slow- Tom's Tours and Water Taxi. In any event, I'm sure there's a lesson to be learned here. You don't need a howitzer to kill a spider- even a big one. A twelve gauge will do... or even a big stick; and you don't need dynamite to remove a few rocks, but what the hell, if someone else is paying, why not go for the gold? Jan and I grabbed up Jen and Kaylahni and made a mad dash out to Freshwater Bay last Sunday. We wanted to take advantage of the sunshine. There has been darn little of it this year, even though the winter has been exceptionally mild. It was almost fifty degrees in the sun, so it felt great. It's hard to imagine the East coast suffering through record snow and cold, while here in Alaska, we hardly have enough snow for the Iditarod dog sled race. Simply amazing, but I'm not going to complain. The road out is all gravel and narrow with lots of blind spots and hills, to say nothing of potholes, so you can't really drive all that fast on it. I think it's about twenty seven miles to get out there, but it still takes over an hour to get there- sometimes longer depending on the condition of the road. When we got there, Jen wanted to build the fire. She had been out to Long Island the day before and had built a towering inferno, so I guess she thought she was a regular Daniel Boone, or maybe it's Danielle Boone. In any event, I figured she may as well, otherwise I wouldn't stop hearing about her prowess as a fire bug. I was busy chopping a few blocks of wood to throw on top once she got it going. As it was, even though she used dry grass and spent a fair amount of time breaking up sticks and shoving them in a pile, the fire never did really take off. She seemed to think that you had to blow on it until you became light headed and eventually passed out in order for it to start. Well, after some time had gone by, I could see that her efforts were going to be fruitless, so I just grabbed a jug of motor oil out of the back of the truck and soon we had a roaring blaze. It was either that or we would have all fainted from hunger. Once the fire was going, Kaylahni put her skills with a knife to work and whittled out a few sticks to pierce our hot dogs with. She was much more successful than Jen was with the fire. I hadn't noticed until I started to post these pictures, but apparently there is something in the DNA of female humans that requires them to ensure that their meat is sufficiently cooked. The first three pictures show grandma, mother, and granddaughter all checking the weenies dangling on the end of the sticks. What the .... ! God forbid that you should eat one only partially cooked. I guess there is some wisdom in that actually. If we really knew what went in to making a hot dog, we'd probably bathe them in a sterile solution for half a day before torching them in a flame that would be reminiscent of a a rocket leaving the launch pad at the space center. As the saying goes, ignorance is bliss! I really don't want to spend too much time thinking about my food. I just want to shove it into my mouth and get on with life. Fortunately Jen didn't drop her dog in the fire this time. On the one hand, I was kind of disappointed - I kind of wanted a little entertainment. Since there weren't any fish in the creek right now, or at least none that I knew of, we decided to spend part of the day shooting at some pop cans on the beach. It's been a while since I've shot my guns, so I was kind of rusty. I still managed to hit the can five times, but given the fact that we fired over sixty rounds, that wasn't too impressive. I don't know if Jen ever did hit it. When we went down to the beach to check on the condition of the cans, there were a multitude of gouges in the mud where the bullets either went high or low. Still, it was fun. With this mild weather it probably won't be long before the bears make an appearance. If they do, we better hope that someone else is along who can shoot a gun. Lord knows that Danielle Boone and Thomas Davy Crockett sure can't be counted on to keep the tribe safe.